March 1981: A European quarter-final against East German giants, under the floodlights in South Wales. After the first leg, a contemporary German match report had noted favourably that one of the visiting forwards ran more than 15 kilometres. Interviewed after that match, a player from the Welsh team, understandably heady with a late equaliser - arguably the club's best result in their history - had dreamed aloud of a semi-final against the might of West Ham United. For the second leg, an unpretentiously dilapidated ground in Monmouthshire is crammed with more than 18,000 - nearly four times the average gate that season. With a dynamic vibrant squad - including a young striker who would go on to win titles with Liverpool - the future looks bright. The future looks amber. Fast forward seven short years to April 1988. Newport are bottom of the Fourth Division, on their way to conceding more than 100 goals. Having lost three successive games 4-0 in South Wales, they travel to Torquay and put out a scratch youth team: all the first-team players have long since been sacked to save money. After they lose 6-1, the brave but demoralised youngsters have to wash the dirt off their kit themselves: there isn't even any cash for washing powder. That weekend, a 6-0 loss at Bolton confirms Newport's second successive relegation, this time to non-league for the first time since the 1930s. Less than a year later, after failing to fulfil their fixtures with debts of £330,000 dwarfing their three-figure crowds, County finally go out of business on 27th February 1989. In the summer of 1989, months after Newport County FC had been wound up amidst acrimony and absurdity, 400 proud Newportonians met at the Lysaght Institute to re-form the club. Even the building they met in encapsulated the town's defiance. Building a club from nothing was hard. Newport were compelled to play their first season in the improbable location of Cotswold market town Moreton-in-Marsh, their enforced expatriation to Gloucestershire earning them a new nickname of 'The Exiles'. After fighting the Newport Council and FAW for years, in 1995, back in the city at the newly-built Newport Stadium, they romped to promotion again to the Southern League Premier Division - three tiers below the 92. Nine seasons on, a reorganisation of the non-league pyramid saw them land in the Conference South; in 2010 Dean Holdsworth's side stormed to a 103-point title triumph and promotion to the Conference National, just one tier below the Football League. On 6th May 2013, a day short of 25 years since they last appeared in the league, Newport beat their compatriots Wrexham at Wembley to secure promotion to the Football League via the Conference play-offs. In the first ever Wembley final between two Welsh teams, Justin Edinburgh's side won 2-0 with the first goal scored by Christian Jolley, who was born five days after that last league game. After a generation in the wilderness, the Exiles had finally reached the Promised Land. With Cardiff City having been promoted to the glamour and riches of the Premier League, Swansea City consolidating their place in it while winning the League Cup to get into Europe, and a Gareth Bale-inspired Wales again gaining critical acclaim, Welsh football is on the rise again. But the Exiles story doesn't end there. *Promotion = Due to his promotion I won't use him in the career as a player. Just some facts. I'm 23yrs old and originally from Germany. I'm calling Newport my home till March 2018. So please bear with me if my English isn't perfect. Due to the language barrier I copied the texts telling the exciting History etc. I didn't want to withhold this. I'm a big football fan, so I'm playing Fifa for ages. And cause I'm living here I'm glad that I got to know this great club here in Newport. I already started a career, but I really like the idea of CMSs here and it's a pleasure to follow all the other great stories. So I wanted to share my experiences with you and here I am. Do it again, start from scratch again. Incidentally improve my English. What next for #TheExiles after their greatest escape? It took Newport County 25 years to go from extinction to the Football League, but it took Mark O'Brien just one swing of a right boot to transform their future. Seemingly dead and buried when former player and local lad Mike Flynn took charge with 12 games remaining this term, 11 points adrift of safety and once again at their lowest ebb, County had been written off. For a club who have adversity running through their DNA and always have done, this was set to be a sad footnote to a glorious resurrection. Since Edinburgh's departure in March 2015, six men have arrived and left Rodney Parade, with ex-international players like Warren Feeney and Terry Butcher finding the job no easier than coaches Jimmy Dack and Graham Westley. Westley exited in March with County looking all but relegated and Flynn given a seemingly impossible task for a rookie boss. The Exiles completed the unthinkable on Saturday, however, clinching survival thanks to O'Brien's last-gasp strike gifting them the three points they needed to stay up in League Two. The ramifications for a club that is fan-owned, are monumental! Roared on by a record crowd of 7,500, Newport have re-engaged their fanbase, according to chairman Gavin Foxall. 'The whole game was a rollercoaster and the last 10 minutes even more so. At one point we thought we were down and out,' he said. 'I've seen nothing like it' - Defender David Pipe is a former Wales international as well as being the captain of County's 2013 play-off team, but the loanee re-signed by Westley from non-league Eastleigh says Saturday's win eclipses everything else. There seems little prospect of that happening, with Newport finally ready to dream again after somehow escaping a nightmare campaign with their Football League status still intact. So what is this club capable to achieve? Rised from the ashes, fighting their way back to EFL League 2 and escaped relegation with neverseen motivation and passion. This club seems stronger than ever and is ready to fight for the dream! Great opening so far. Looking forward to what you have in store going forward. Yes. Fantastic posts and nice reading. Cheers guys! Really appreciate it. Great to see you here. I'm also looking forward to the new season and the new challenge. This team has a good potential and I'll try my best to get everything out of them. Michael Flynn really didn't have an easy task when he took over his homeclub last season. Tired players in a team that is sitting at the end of the table again. Flashbacks appeared and the fear of failure was noticeable everywhere. Truly not the best conditions for making his first steps as a coach. But his passion for this club was unbelievable. No he is facing the next season in his new position. Is he able to take this team to the next level? We will find out. Good luck. Nice opening posts and an interesting team choice. Great read there fella. From an Amber. Thank you guys! I really like the challenge of fighting in lower leagues. Lower budget, longer season and more equal teams through the league. So will see how far I can take them. In order to prepare for the new season Newport County take part in the European International Cup which is held in Hamburg, Germany. An own goal saves the day and Newport claim their first point this season. A sublime first half and an awesome McCoulsky paved the way to Newport's first victory. Matthew Dolan smashed the opposite defense with firing down 3 goals and applied for a S11 position. Newport County survived the group stage and moves on to the semi final where M. Flynn and his team will face 'Hallescher FC'. Great start in the pre season. Attack looks particularly sharp scoring 6 so far. Don't know much about Tozer but seems like a decent amount of money to get for someone surplus to requirements. One minor suggestion if that's ok, the team names on the scoreboards are a little hard to read. Great start to the preseason. Have to agree with the club names. Very hard to read. Honestly not sure if you really need them. Good pre-season!!! Since the beginning you seem to find the best for the team, which is good news. About the graphics, they're nice. Personally I woulnd't get rid of the names, because it may be very difficult to recognize some teams only by their badge, especially if they're not well-known clubs. Just a suggestion. Aside this aspect, the graphics look very nice and clean. Any players on here who have read this that are from Newport? A late goal from Rigg secures the win against german third tier 'Hallescher FC' to progress to the final. Newport County win the cup title by winning against 'GIF Sundsvall' with Joe Day having a sublime day. M. Flynn and his team finish off a perfect preseason by winning the European International Cup. 'This was a great performance by every single player. Everybody showed themself by giving their best. We were able to test several lineups and we won a first impression of what this team is capable of. Now we will focus on the start of the season next week and eradicate the last mistakes that were noticeable', summarised M. Flynn after the cup win with a big smile on his face. M. Flynn and the board are happy to announce 3 new players to the club. 1. Defensive midfielder Enrique Serje joins the club from colombian site 'CPD Junior Barranquilla'. Newport paid around £450,000 for the 21y old as they expect him to develop well at the club. 2. Winger Elliot List joins the club from 'Gillingham F.C.' when both parties agreed on a transfer fee of £150,000. The 20y old can play at both wings and can help Newport with his pace and freshness. 3. Andre Dozzell joins the club from 'Ipswich Town' on a loan till the end of the season. 'Dozzell is a very talented player that is able to help our team instantly and gives us some depth in the squad' said Flynn when being asked. On the other side the board announces 2 players that will leave the club. - Centreback Scot Bennett leaves the club and joins 'Yeovil Town'. Newport earns an estimated fee of £130,000 for the 26y old who can get more playtime at his new club. - Striker Marlon Jackson gets transfered to 'Crewe Alexandra' where he will meet his former teammate Ben Tozer. Both parties agreed on a transfer fee of £110,000, as the 26y old's development was not as expected. Fantastic preseason. It couldn't be better. Now time for the real thing. I don't know much about the signings, so I can't give a proper opinion. Let's hope they make the team a better side. Great way to finish pre-season. Bodes well for the start of the season. Don't know much about the transfers tbh but time will tell. Dozell is a massive signing. Kid has so much potential. I know it’s a loan but I think he can help you out right away. Yeah the preseason was really good and the team handled various tactics and formations well. The pivotal argument for the transfers was the flexibility of all the guys. Everybody is able to play different positions and so I can play different tactics and formations, especially when rotating the S11. 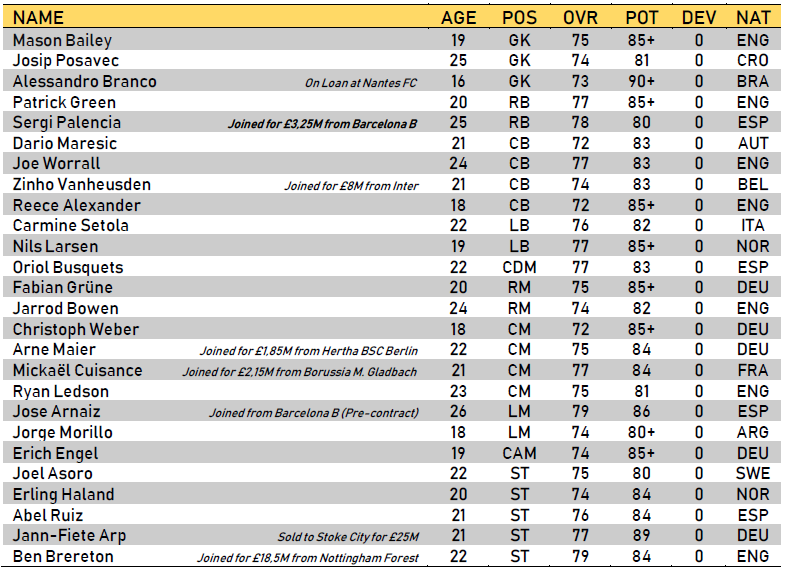 And Serje and List have some (good) potential and due to expiring contracts I got them for decent fees. Oh yes he's definitely a really talented guy. I would have loved to sign him but unfortunately I couldn't afford him. The board gave me some strict financial objectives. But he can definitely help the team instantly...and will see, maybe the future changes the financial situation. Newport failed to continue their run of the preseason as they lost their first game of the season. Willmott saves the day with a late goal when Newport won a tough away game against Blackpool. A great comeback from Nouble secures the first 3 points of the season after his injury. After Frank Nouble coming back from his injury it's now Aaron Williams who will be out for about 8 weeks after suffering a dislocated shoulder. He collided with a defender and landed badly with being substituted for Nouble afterwards. Good recovery after losing the first game to be honest. Victory over a club a division higher than you is particularly impressive. Convincing 3-0 win in the league rounds things off nicely. After the initial defeat, the team return to solid results. Accidents happen. Shame of injuries. 2 months is a lot of time. Is it an essential player of the team? Couple of nice wins. Hopefully the injuries slow down. Blackpool was a really tough game. I'm glad that we managed to claim the win there. Could have gone both ways. He is one of 3 strikers that are normally playing in the S11. I'm glad that Nouble is back to replace him for now. These injuries are really annoying especially during the start when the team try to perform well together and grow together. Hope they slow down as well, some tough weeks regarding the schedule are ahead. A furious Newport team run over 'Coventry' when the newcomer had a great impact. After winning their last league game away against 'Coventry F.C.' in an excellent style Michael Flynn's team have to face 'Hull City' in the second round of the Carabao Cup. With 'Hull City', currently playing two tiers higher than Newport, a real clash is expected. It will also be the first game at home for Newport this season. The Rodney Parade is sold out, the fans are hyped and everything is prepared for the big game with Newport County going into the game as the outsiders. But as we know the cup has his own rules. Will David really be inferior to Goliath? Newport is escalating when a fearless Newport County shock the big 'Hull City' with a furious win. A rotated S11 impresses when a decimated 'Chesterfield' broke down at the end of the game.